Garmin nuvi 310 displays detailed street-level road maps for UK and Ireland on an easy-to-use colourful 3.5-inch touchscreen and provides clear, voice-prompted directions to your destination. The Garmin nuvi 310 also provides hands-free calling via the wireless Bluetooth module and features full UK postcode search and optional speed camera locations via the Cyclops speed camera database. The Garmin nuvi 310 also includes the option to use the unique Garmin nuvi Travel Guides which provides helpful and thorough reviews and recommendations for restaurants, hotels, shopping, nightlife, sporting events and tourist attractions, along your route. Garmin nuvi 310 has been discontinued. Accessories, spares and parts are still available for your nuvi 310, as are road maps. The Garmin nuvi 310 is preloaded with City Navigator NT street maps for UK and Republic of Ireland, including points of interest (POIs) database with hotels, restaurants, petrol, ATMs and more. Like the rest of the nuvi series, the Garmin nuvi 310 sports a sleek, slim design and fits comfortably in your pocket or purse. Its rechargeable lithium-ion battery makes it convenient for navigation by car or foot. The Garmin nuvi 310 3.5-inch colour antiglare touchscreen display is easy to read - from any direction. View map detail, driving directions, photos and more in bright, brilliant colour. The Garmin nuvi 310 also features a full UK postcode search. Simply enter a destination or postcode, and the Garmin nuvi 310 will take you there with 2D or 3D maps and turn-by-turn voice directions. In addition, Garmin nuvi 310 accepts custom points of interest (POIs), such as school zones and speed cameras and lets you set proximity alerts to warn you of upcoming POIs. The Garmin nuvi 310 integrates Bluetooth wireless technology with a built-in microphone and speaker for hands-free calling. Just pair the Garmin nuvi 310 with your compatible Bluetooth phone and talk hands-free through the nuvi 310 while staying focused on the road. Simply dial numbers with Garmin nuvi's 310 touch screen keypad to make a call. To answer calls, just tap the screen and speak directly into its built-in microphone. The Garmin nuvi 310 includes many travel tools including JPEG picture viewer, world travel clock with time zones, currency converter, measurement converter, calculator and more. The Garmin nuvi 310 also comes with Garmin Lock, an anti-theft feature. The Garmin nuvi 310, like all Garmin sat nav's, gets its speed camera data from the Cyclops speed camera database. The database provides advanced alerts to fixed, average speed, mobile, variable, temporary roadwork, red light and red light speed cameras. As you approach a camera, your device sounds an alert. Subscription charges apply. Click here to read more about the Cyclops speed trap database. The Garmin nuvi 310 has been designed to be plug and play, and as such can be transferred from vehicle to vehicle with ease. The Garmin nuvi 310 is powered with the 12-volt vehicle power adaptor and attaches to your vehicles windscreen via the Garmin nuvi 310 suction cup bracket. Alternatively with the dashboard disk you can mount the suction cup bracket on your dashboard instead, all three accessories are supplied with the Garmin nuvi 310. The Garmin nuvi 310 is preloaded with City Navigator® NT for UK and Ireland provided by NAVTEQ. NAVTEQ maps provide high quality detailed street level maps, which in addition to street information include features such as route calculation, Points of Interest (POI), Estimated Time of Arrival, and more. Further Garmin nuvi 310 maps are available SD card which insert directly into the Garmin nuvi 310. 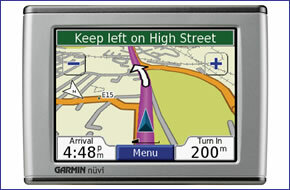 Available Garmin nuvi 310 maps include, France, Spain, Germany, Western Europe, Eastern Europe and North America. View the complete range of maps available for the Garmin nuvi 310. Looking for accessories and spares for the Garmin nuvi 310? All parts are genuine Garmin product and specifically designed for use with the nuvi 310. Accessories available to purchase include vehicle power charger, suction cup mount, a weighted dashboard mount and an external GPS antenna. Along with these accessories, it's also possible to buy replacement parts such as suction cup mount and vehicle charger. Looking for sat nav maps for the Garmin nuvi 310? All mapping comes on microSD card with SD card adaptor and is genuine Garmin product and specifically designed for use with the nuvi 310 Countries available to buy include: UK and Ireland, France and Benelux, Full Europe, North America, Australia and New Zealand. Question: I wonder if you could help? I have a Garmin Nuvi 310, I know that they are now discontinued, and now as no maps on, will it be possible to put new maps on, Thank You. Answer: Yes, you can view and buy all compatible Garmin nuvi 310 maps here. Subsequent question: Furtherto my last enquiry about my Garmin Nuvi 310, could you please tell me if the maps I purchase will still work? Garmin say they don`t think it will, as the Nuvi 310 has been discontinued. Can you also please tell me if I do get the maps, UK and Ireland, Do I need to go to Garmin to download Cyclops speed camera? Thanks for your Help. Answer: The Garmin City Navigator maps we sell on SD/microSD card are compatible with the Garmin nuvi 310. To ensure the maps work on your nuvi 310, you would though need to ensure you have the latest software/firmware installed on your Garmin nuvi 310 - please see this webpage with helpful tips. Garmin software/firmware updates are available free from Garmin using Garmin Express software. Cyclops speed camera database is not included within the UK and Ireland map. You are correct, you will need to pay the annual fee to Garmin and download directly using Garmin Express software. Question: Could you tell me whether the... Garmin GA 25 MCX External GPS Antenna Product Code: GARGPS is compatible with the garmin nuvi 310? The 310 antennae connects via a usb. Do you know if this will work with garmin fm traffic? Answer: The Garmin nuvi 310 GA 25MCX Low Profile GPS Antenna plugs into the nuvi 310's MCX port and NOT the USB port. The purpose of the GA 25MCX Low Profile GPS Antenna is to provide a GPS signal to the nuvi 310 sat nav via the external GPS antenna. It DOES NOT provide traffic information. You can buy the Garmin nuvi 310 GA 25MCX Low Profile GPS Antenna here. Do you have a question about the Garmin nuvi 310? Submit your question via our contact page.